Subaru has issued an "engineering statement", following criticism of its 2.5-litre engine (used in the Impreza and Forester) on social network sites. Owners on these sites have complained of fragile pistons, which in one case caused £15,000 worth of damage. "You will have been referred to this statement from your contact with several social networking sites. Due to the fact that there has been quite a large amount of inaccurate and misleading comment on a number of these sites, we felt it appropriate from an engineering and technical perspective to outline the design brief of the 2.5 litre Subaru Boxer engine fitted to 2008/2009 Impreza WRX/STI and further explain some facts that will help your understanding. Subaru is an environmentally conscious company that seeks to build products that are thoroughly engineered for the purpose for which they are intended with regard to delivering class leading performance whilst still meeting the very stringent environmental control standards demanded from modern day vehicles; not only by customers but also by the European Union. The Subaru team of Engineers, who we believe to be the most capable and knowledgeable in the business have designed the 2.5 litre unit with lighter weight and lower friction materials, giving higher power without sacrificing current emission and CO2 outputs. The expectation therefore, is that provided the engine is operated within design criteria, using correct fuel grades (97 RON) and serviced within the manufacturer's guidelines, the engine will prove its durability in keeping with Subaru traditions. From a statistical viewpoint, to date 1,044 Subaru Impreza WRX STI 08/09 model year vehicles have been supplied into the UK market through our distribution network and only a small percentage of those have suffered any kind of engine failure. It was recognised very early that a modification to the fuel cut off parameters at maximum engine revolutions was required to reduce impact stresses to the piston land area, therefore an ECU map re-write was introduced on all production vehicles. Also vehicles held in UK stock were modified and a Service Campaign was issued to the UK Subaru network for vehicles already placed in the market. As previously stated, our engines are designed to be operated within the design brief. Where owners have decided to unilaterally modify their vehicles, it can be expected that failures will almost certainly occur. The view taken by our warranty staff has been to investigate thoroughly each case presented, and where evidence is in any way inconclusive, we have always covered those units under the terms of the new vehicle warranty. As customers should rightly expect, the engine will rev freely throughout its complete range, without fault, as long as the points above are observed. You may be aware of a recent joint venture between Subaru (UK) and Cosworth in the development of the Impreza CS400 producing 400 BHP and 375 ft/lbs of torque. This engine has been entirely re-configured from the bottom up to ensure reliability at these power and torque outputs. The high degree of testing and engineering expertise employed by both Subaru (UK) and Cosworth on this project serves to highlight our belief that simply adding performance componentry without an exhaustive development programme will undoubtedly compromise reliability - as other performance tuners have found to their cost. To benchmark the project, a standard WRX STI engine unit was run on a Dynamometer for 50 hours non-stop at varying power and speed settings to replicate the most extreme usage and to highlight any areas of concern; needless to say, no problems became evident despite being operated under these intense conditions. 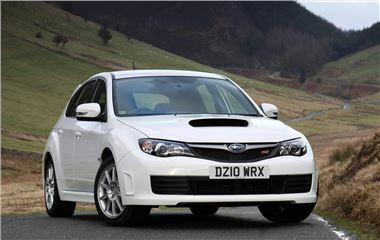 Cosworth Technical Director, Bruce Wood, confirmed the WRX STI OE specification unit passed Coworth's test regime. "We were encouraged that the standard STI engine passed our 50 hour continuous test, which we consider to be rigorous, as this indicated that the starting point for the CS400 programme was suitably robust." Our stance is clear and consistent on these issues; where customers are prepared to modify and/or operate their vehicles outside the design parameters, this will invalidate our warranty agreement because it can be expected that failures will occur through no fault of Fuji Heavy Industries or Subaru (UK) in regard to faulty manufacture or improper design, always remembering that the 08/09 STI is designed to be completely reliable at around 300 BHP (and 330 BHP for the STI 330S) but not at 350, 380 or even 400 BHP - power levels at which some owners claim to be running their vehicles. Where any doubt exists, the warranty available through Subaru (UK) is there to support any engine and vehicle defect reported. Should any customer/owner require assistance with engine or indeed any vehicle related issue, the initial approach would be to discuss the problem with your selling/servicing dealer who will involve the services of Subaru (UK) if required. Customer satisfaction is at the heart of everything we do and it is absolutely not in Subaru (UK)'s interest, either financially or reputationally, to decline fair and proper warranty claims. We will not do it. Delivery of excellent customer support is our goal, and our award-winning performance in this area over a period of more than 30 years is no coincidence. We would like to thank you for choosing Subaru and ensure you of our endeavour to make your ownership experience a good one. Good to see a manufacturer defending their product in a professional manner.